University of Nevada, Reno team members and canoe, Alluvium. Photo credit: University Nevada, Reno Concrete Canoe Team. 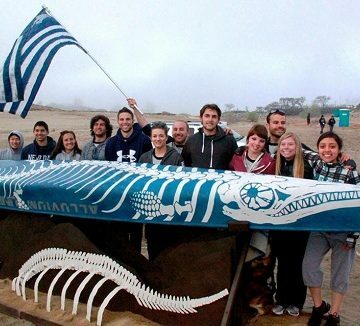 Like the prehistoric marine predator, ichthyosaur, the University of Nevada, Reno concrete canoe and team were designed to take out the opposition. After 3 days of competition against 22 other teams, students from the University of Nevada, Reno and their canoe, Alluvium, won first place at the 2014 ASCE National Concrete Canoe Competition (NCCC), held at the University of Pittsburgh at Johnstown, June 19-21, 2014. Assembling the Nevada, Reno team was like unearthing the fossilized remains of the majestic ichthyosaur: though buried beneath what were once layers of marine sediment known as alluvium, seismic fault patterns ultimately revealed ichthyosaur fossils. Similarly, the Nevado, Reno team had to be skillfully uncovered by its project managers – but once it was, the team members formed an undeniably strong connection, spending many late nights and long weekends developing their concrete mix and attending paddle practice on the open water. The bottom of Alluvium is painted with an artistic interpretation of the ichthyosaur’s skeletal form. In spite of placing amongst the top 2 teams in all 5 races at NCCC, the team remained skeptical that they would win “America’s Cup of Civil Engineering.” A 10-point deduction made because “our concrete samples were not within the density that we recorded” prevented the team from placing amongst the top 5 teams in the “Final Product” category, according to Martin. 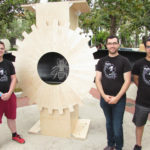 Despite reporting the concrete density incorrectly, the team worked tirelessly to improve the exceptional performance of its canoe in attempts to trump their university’s second-place finish overall at the 2013 competition. “The team performed extensive tests on materials to determine the minimum required fiber ratio for producing a smoother finish while maintaining the required flexural strength. The incorporation of a water-resistant admixture as well as recycled glass aggregates benefited the sustainability of the concrete,” according to the team’s design paper. Connecting the classroom with real-world experience, NCCC challenges students to take on leadership and project management roles while mastering concrete mix designs. ASCE President Randy Over explains the importance of the Concrete Canoe Competition in the lives of engineering students to an ABC News affiliate. The skills students gain while preparing for Concrete Canoe are “directly applicable to their lives as professional engineers,” explains ASCE President Randall (Randy) S. Over, who had the opportunity himself to participate in a regional competition while studying civil engineering at The Ohio State University in 1982. Although the first ASCE National Concrete Canoe Competition dates back over 25 years to 1988, ASCE chapters around the country have been holding intramural concrete canoe races since the 1960s. These days, students spend between 3,000 and 4,000 hours throughout the school year in preparation for NCCC. After testing and refining their concrete mix and composite, the teams develop a hull design and mold, then pour and cure the concrete before staining the canoe. Vying for their slot at the national competition, teams participate in ASCE Student Conferences held regionally throughout the U.S. in the months leading up to NCCC. The teams also document their design-build journey in a formal paper and presentation, including details about the development and testing of the concrete mix used in the canoe. “We want the ideal mix to be light; we want it to be workable so that it’s easier to place. We also want it to be strong enough that it will hold intention,” explains Zachary Murray, student member of the University of Pittsburgh at Johnstown team, the host chapter of this year’s NCCC. Co-Project Managers Austin Martin and Kristin Kramer share an emotional moment after their team was announced as the winners of NCCC. The qualifying teams at NCCC are scored across 4 equally weighted categories: engineering design and construction principles used in the creation of the canoe; a technical design report detailing development, testing, and construction processes; a business presentation highlighting the canoe’s innovative features – design, construction, and racing ability; and finally, canoe and paddler performance in 5 different slalom/endurance and sprint races. 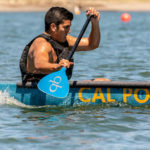 The National Concrete Canoe Competition is organized by ASCE with generous support from American Concrete Institute, Dassault Systèmes SolidWorks Corp., GEICO, and the ASCE Foundation. Congratulations to UNR, a team that has competed well and aggressively for quite a few years. This is the result of dedication and good work from lots of team members. Well done! I’m a civil engineer and had some investigation about high strength lightweight concrete made with artificial lightweight aggregates,and wonder why they used rescycled glass aggregate here..